Experience the weightless texture of Nykaa SKINgenius Sculpting & Hydrating Foundation - Golden Honey 05. This luxurious long-wear formula lasts all day long, keeping your skin fresh and radiant. 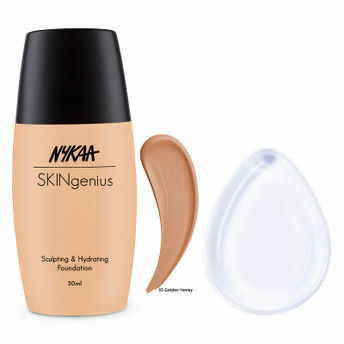 Enriched with Polylift technology and Hyaluronic Acid, this foundation not only sculpts and lifts your skin but also imparts oodles of hydration to it. The unique color-adapting technology allows you to get a perfect match to your skin tone. It is also equipped with sun filters that shield your perfect complexion. Let the imperfections disappear and let your skin glow!